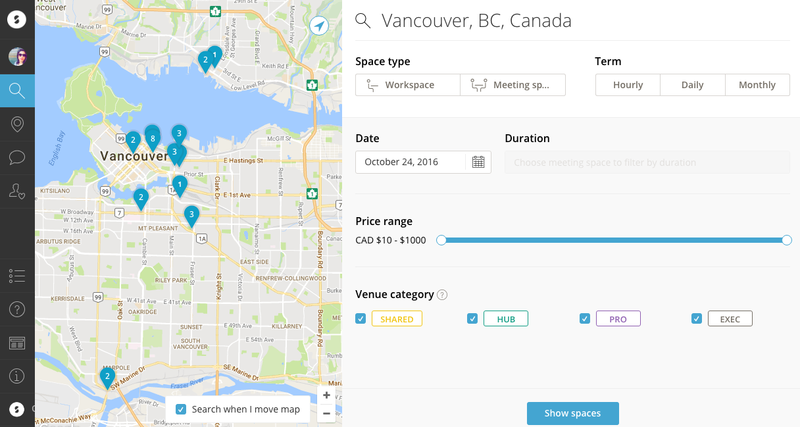 You can find a venue from the homepage, or from the Search for a space page (accessible from the left side menu of the main website). Using the filters in the top right corner will help you to narrow down your search. The results can be filtered by space type, duration, and capacity (i.e. the number of people the space can accommodate). You can access more information about the spaces by clicking on the images in the results list, or by clicking the pins on the map and then the space name (e.g. Dedicated Desk). The number on the pin indicates how many different spaces are available at that venue. Clicking on the venue name takes you to the venue profile. Once you've selected your ideal space, click Book to make your booking. Note: Spaces can be searched by their names.